Every selectable font is listed here. The fonts in this list will be used in the CSS. Move the currently selected font from one list to the other. Adjust the order that the fonts are used in the browser in. 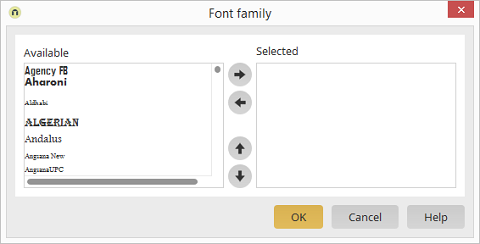 If the client does not support the first font, because it is not installed, the other fonts will be tried one after the other.